From the start, we knew it’d require a different mindset. Not since our honeymoon 10½ years ago had Karen and I spent more than three or four days at the cabin. Eight days, however, clearly presented an opportunity for adventure; exploration at our own pace. I did spend a couple of days fishing, but our destinations most days were only decided the evening before and sometimes only that morning. Our internal alarm clocks — or at least mine — meant I was up by oh-dark-thirty every morning, but that left plenty of time for a full breakfast if desired. More than anything, we wandered; around town (Twain Harte) and through hill and dale. The higher elevations were colored by fall foliage while below 2,000 feet the grass of the oak woodlands was a pale gold. Our day-long loop through Copperopolis, Angles Camp and Columbia took us through these distinctly different habitats, past the Sierra Conservation Center (aka prison) and over the very low New Melones Reservoir. In all my years in the area, never has New Melones looked less like a lake and more like a canyon than it did last week. A map won’t tell you that Copperopolis has something of a split personality. The “real” Copperopolis — near Reeds Turnpike — was established in the 1860s and is a bit unique in that it was founded near a copper mine, not gold. But just north, near Hwy 4, is what looks like a Hollywood set plopped down in the middle of nowhere. It reminded me of the town of Lago, in High Plains Drifter; without the red, of course. The buildings in Copperopolis Town Square tap historical architectural design of the mid and late 1800s, with retail shops and restaurants surrounding a small park with a gazebo, landscaped fountain and flag pole. Allowing for the fact that we were visiting on a Wednesday, during the fall, it was still quite vacant. It’s clearly designed with a pedestrian focus, including park benches, stone masonry walls and faux old-fashioned gas lamp posts. It was a nice enough place for a leisurely walk, with a stop for a root beer float in an old-style ice cream parlor. The town square is nice enough, but peeking behind the curtain — actually one block off the main street — reveals paved streets complete with sidewalks and lightposts but devoid of homes; just dirt lots. While folks there will tell you Copperopolis Town Square is a phased development, I couldn’t help but wonder if these vacant lots were remnants of the recession. After all, developer Castle & Cooke did break ground on Copperopolis Town Square in April 2006. Our loosely outlined plan was to stop in Angels Camp and Columbia before returning to the cabin. One suggestion: Don’t visit Angels Camp on a Wednesday; it seems as if half the businesses were closed. The drive from Angels Camp to Columbia was interrupted, however, by my sudden veering on to Red Hill Road near Vallecito. 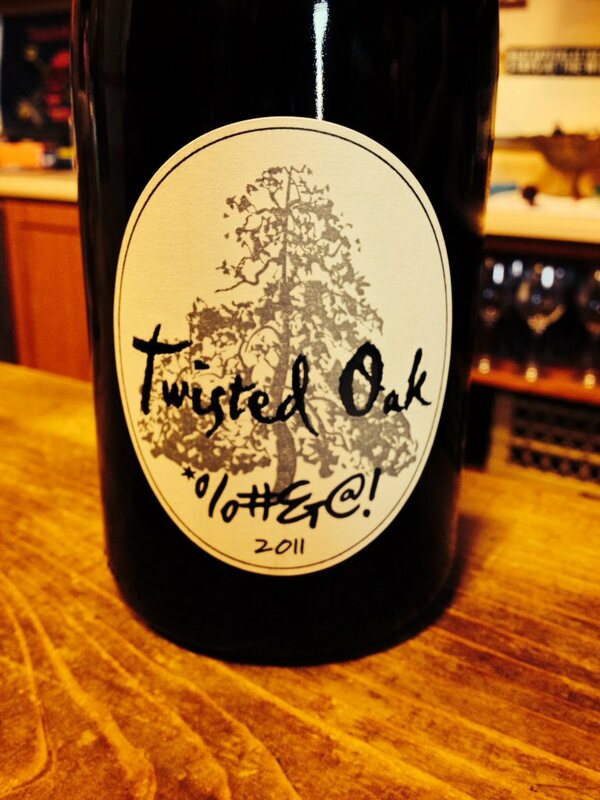 During the summer I met a young man dispensing tastes at Mammoth Brewing Co. and learned in the course of conversation that his family owned Twisted Oak Winery. He was taking a break from the wine business to learn about beer, and after I mentioned the cabin in Twain Harte, he suggested a stop at the Twisted Oak tasting room in Murphys. I didn’t know the winery was in Vallecito until I saw the sign. It was clear this was a place where the folks didn’t take themselves too seriously; the posted speed limit on the driveway is 9 mph. One wine label says it all: “*%#&@!” (described as a potty-mouth Rhone-style red blend). It’s a friendly place, and laughter pairs well with wine, so we lingered, bought some wine then headed on down the road. We covered about 80 miles that day, agreeing to expand the circumference of our exploration the next time we can take the time to slow down. It became clear we were enjoying ourselves and spending our time wisely when my sister emailed to ask if we had retired and not told her. Not yet. But it sure was nice to spend a week acting as if we have. Categories: California, Family, Food & Wine, General Discourse, Sierra Nevada, The Wife, Twain Harte, Vacation & Travel | Tags: California, Copperopolis, Sierra Nevada, Twain Harte, vacation, wine | Permalink. Cool area we live in, huh? Maybe one day Volcano, Black Chasm, Grinding Rock SHP, or Daffodil Hill. I’d buy lunch. Sounds like a plan…lot of places to see (and fish).